Kate Mason has always found solace in her family s blueberry barrens. But are they giving her a false sense of security? Kate has devoted herself to keeping her family s blueberry barrens thriving. But when blossom blight devastates her blueberry fields, she s forced to come up with alternative ways to replace that income. Fixing up the small cottage on her property as a rental seems an obvious choice, but it won t be enough. When Drake Carver drives by with his two nieces in tow, looking not only for a place to rent for the summer but also for a nanny for the girls, it s almost too good to be true. Drake is a judge whose brother and sister-in-law died in an accident shortly after he received a threat that his family would suffer if he didn t drop a high profile case. Is there a connection? This remote area of Maine seems like the perfect place for him to keep his nieces safe until he determines if they re in danger. Drake and Kate constantly lock horns; having never been a parent before, he gives his nieces free reign. Kate won t stand for their disrespect and keeps challenging Drake to set a higher standard. Even though Kate has given up on having children because of the chemo she had to take, she finds herself oddly drawn to this improvised family. But Drake begins to fear that he s putting Kate in danger as well. Meanwhile, Kate learns that her uncle in prison for murder has escaped. Add to that a stalker whose sights are set on her, and Kate is looking over her shoulder at every turn. With danger swirling from multiple directions, it may be a question of who gets to her first." 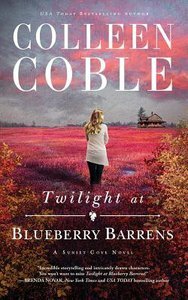 About "Twilight At Blueberry Barrens (Unabridged, 8 CDS) (#03 in A Sunset Cove Novel Audio Series)"
Customer Reviews For "Twilight At Blueberry Barrens (Unabridged, 8 CDS) (#03 in A Sunset Cove Novel Audio Series)"
Once again Colleen Coble blends a great adventure for her readers. Kate Mason finds herself in trouble when her family's blueberry fields stopmproducing berries, she does up and rents her little cottage to Drake Newham who is desperately seeking answers to the death of his brother and sister in law while protecting his nieces. Kate has her own dangers and is it safe the she also take on being Nanny to the girls? Kate understands their grief but wants to keep them safe too. A great read in this A Sunset Cove series. You'll be turning pages and forgetting about the house work! Order now to secure your copy when our stock arrives. Other edition is available. 9781401690267 0 Available. Expected to ship in 6 to 7 weeks from Australia.